Yelp, Urbanspoon and Facebook has doubled." Local Search Marketing is fundamental to online visibility, and this marketing service is not done by SEO technicians (Search Engine Optimization). With this service, Hospitality Ambassadors will create an account for you within each of the most highly trafficked websites such as Google, Yelp, TripAdvisor, Citysearch, Urbanspoon, Bing, and many more. Once we have established your account, we are able to add an additional 60-70% more information about your business directly to your listing, increasing the likelihood that your business listing will be ranked higher than your local competition. Can I add a special offer or coupon to my listing? Yes! Promoting a special offer on local listings is one of the most effective ways to increase visibility and visitors. By adding an offer, your listing will stand out among other local listings within the search results pages, attracting "pre-targeted" traffic to the listing and new customers to your business. 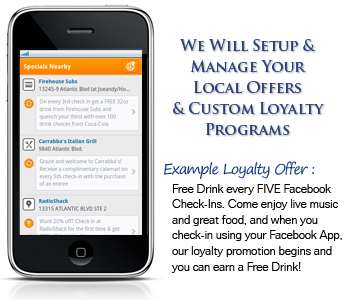 50% of all local searches are performed on a mobile device - and your special offer will also generate more mobile traffic. Local Search Marketing with "offers" allows you to grow visibility through mobile Apps that provide a "Specials Nearby" link. These links allow a mobile user to view businesses in close proximity - often within walking distance - which have an active special offer through their local listing. When mobile users search, are you invisible? Comscore reports more than 50% of local searches are now performed on a mobile device. In addition to these searches, apps like "Google Places" and "Yelp" offer the ability to search "Nearby". This is an extremely valuable opportunity to capture mobile marketshare and our local search optimization has increased client visibility by an average of more than 70%.